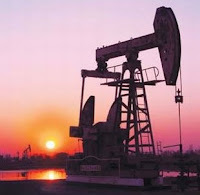 Oil prices fell slightly to near $71 a barrel Tuesday in Asia after signs of economic recovery in the U.S. fueled stock and crude rallies. Benchmark crude for September delivery was down 48 cents to $71.10 a barrel by midday Singapore time in electronic trading on the New York Mercantile Exchange. On Monday, the contract rose $2.13 to settle at $71.58. Traders have brushed off evidence of weak crude demand and rising inventory levels, instead focusing on improving macroeconomic indicators. A report Monday from the Institute for Supply Management, a trade group of purchasing executives, said U.S. manufacturing activity should increase next month for the first time since January 2008. Also, the Commerce Department said construction spending rose in June. The positive economic news has emboldened investors to bid up stocks and oil. The Dow Jones industrial average rose 1.3 percent Monday and most Asian indexes gained in early trading Tuesday. "With the economy seemingly improving each week, oil has felt pressure to go higher," said Michael Sander, an advisor at Sander Capital in Seattle. "As far as fundamentals go, oil still has very high inventory levels and weak consumer demand, but those just don't seem to matter." A report last week showing U.S. crude inventories jumped the previous week suggested demand remains sluggish, and sent prices below $63 a barrel. Since then, oil has been on a tear as investors anticipate an improving economy will boost demand and whittle away supplies. "Improving demand amid continued supply tightness should accelerate the pace of erosion of the inventory overhang, lending support to prices," Barclays Capital said in a report. In other Nymex trading, gasoline for August delivery was steady at $2.06 a gallon and heating oil held at $1.87. Natural gas for August delivery fell 8.8 cents to $3.94 per 1,000 cubic feet. In London, Brent prices fell 36 cents to $73.19 a barrel on the ICE Futures exchange.